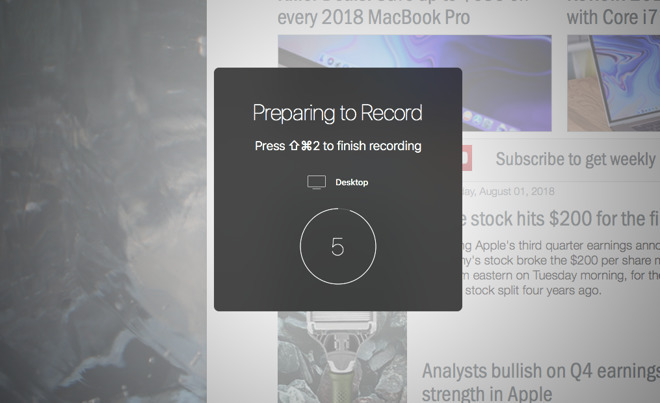 ScreenFlow 8 used to be an exceptional tool for recording your Mac's screen and it still is —but the new update has it knocking at the door of apps like Final Cut Pro for video production. AppleInsider sees if it adds with one hand and takes away with the other. ScreenFlow was pretty much perfect. If there was anything the makers could've added to its core function of recording your Mac's screen then we've had no idea what it could be. So while this is an app we rate so much that we will always upgrade to the latest version, this time we did have to wonder just what ScreenFlow 8 could actually bring us. The answer is primarily that it's added to what the app can do with your Mac's screen recording when it's done. The app records your screen exactly the way it always did. You can tell it to record the entire screen or just a segment. You can tell it to record audio from the Mac or any microphone you've got plugged in. Then then whole point of this initially remains exactly as it was. ScreenFlow is superb for capturing what's on your screen so that you can show someone how to do something. If you've seen any YouTube video about how to use, say, Keyboard Maestro, then the odds are that it was made using ScreenFlow. You can find other apps to do this same job and in fact Apple's own QuickTime Player can do it. Yet ScreenFlow tends to win out because it's such a solid and reliable tool that's easy to use. Whenever we've tried alternatives, most especially including QuickTime Player, we've ended up having to reshoot because frames get dropped. So ScreenFlow became the tool we automatically turn to. 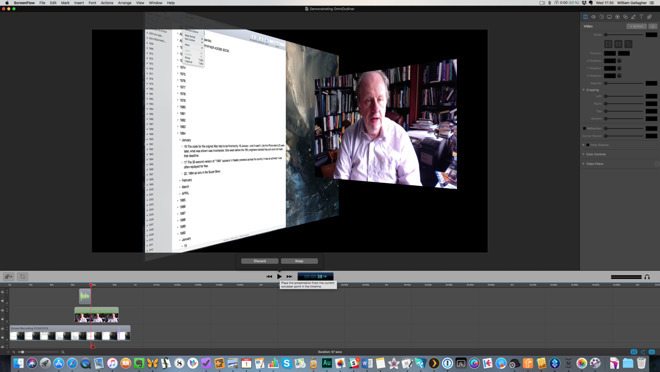 Then when you've got your Mac screen captured, you can stay in the same ScreenFlow to edit what you've recorded. You can cut out those few seconds where you're seen entering your password, for instance. You can cross-fade between the start of an animation rendering and the end. If you want to make someone focus on a particular menu or button in an application, then when you've recorded the screen you can zoom in on that spot. All of this is first-class and we don't say that lightly. It's just that all of it has been in several iterations of ScreenFlow. In 2017 at about this time of year, AppleInsider said that ScreenFlow 7 built on these editing tools to let you do more with any kind of video. Not just screen recordings. We said that it was on its way to becoming a video production suite. 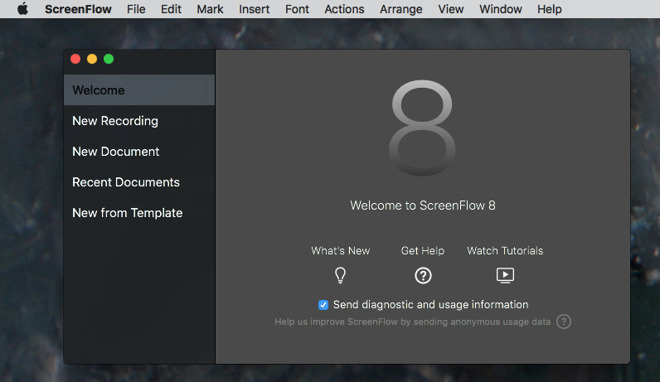 ScreenFlow 8 is now there. We're still focused on using it for Mac screen recordings and there are some new features that particularly support this. For instance, you can now record a narration track right inside the app. Previously you would record it in some other app and then drag it into ScreenFlow as a another track. Now you just press the button, choose your microphone and let ScreenFlow 8 play back your video as you speak. In practice you're going to need to a good mic and studio surroundings as you edit or the audio quality isn't going to be as good. Yet if you are editing in a good place, it's extremely handy to be able to watch what you're narrating as you narrate it. You can also better see what your footage contains because of an improvement to the timeline. 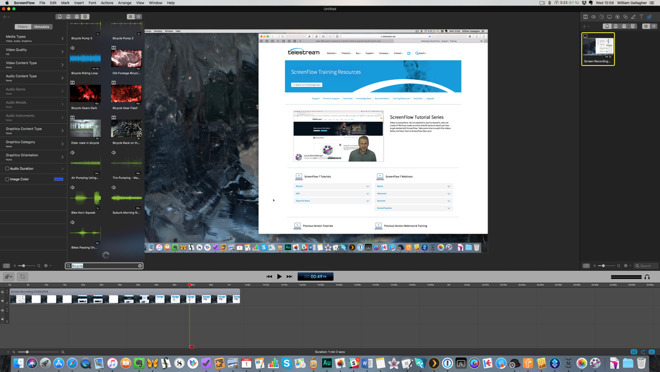 This is the Final Cut Pro- or Premiere-style bar beneath your video window that shows you the length of clips. It's where you can move the cursor to skip through your material. Previously the whole video was a grey bar with a small thumbnail image at the start. If you split the video into clips, each became a bar with an thumbnail. Now the gray is gone and instead the bar is filled with a filmstrip-like row of thumbnail images. So it's quicker to see where a segment begins. If you have multiple monitors you can now also split off that timeline from the video. Have a full-screen view of your recording in one window and the timeline in another. That's perhaps only really useful when you've added so many overlapping layers that the timeline has multiple bars one atop the other. It's features like these that tip ScreenFlow 8 over into being a full production suite, though. As easily as you can add another screen recording, you can add any video or audio. Then you can treat them all the same: trim clips, add narration and so on. 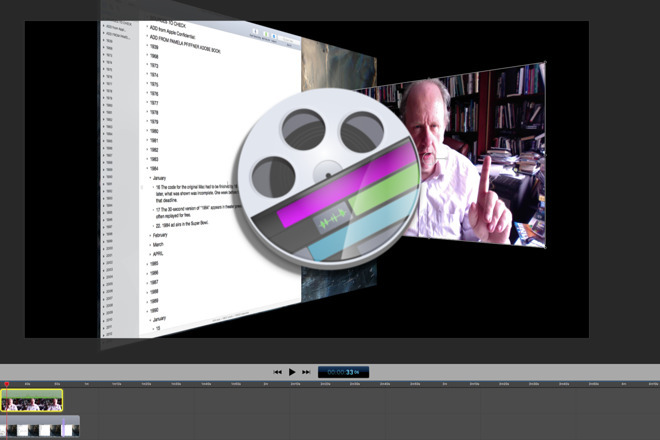 You can also layer video tracks. So you've already been able to add a second screen recording that you cut to at intervals. Or if you think your viewer is bored of seeing a five-hour closeup of OmniOutliner, you have been able to record video of yourself and insert that in a corner. You can fiddle with your screen recordings to crop, resize and rotate them in 3D but now you can do all that and then save your settings. Do it once for a particular part of your video or for a specific track and then you can apply the same settings with a few clicks. You can do this with anything you record —but now don't have to record anything at all. ScreenFlow 8 comes with a stock video, audio and photography library that's claimed to have over half a million items free for you to use. We found some oddities with the stock library, though. Sometimes the same search would turn up different items and on occasion the same search would return no results at all. Most of the time, though, we were able to find items on any keyword we could think of. Then we found the video, audio or photograph, we could drag it onto our video. Once it's there you have a large, possibly ludicrously large, number of options. Video you drag in can be resized, placed anywhere on the screen, turned transparent and have its corners rounded. You can also annotate any video you have in ScreenFlow 8 and that now includes freehand drawing of shapes. Again, we use this as our go-to tool for screencasts and when you're doing that, you don't have to think much about where the footage goes. You just export it to a video format and save the file on your Mac. 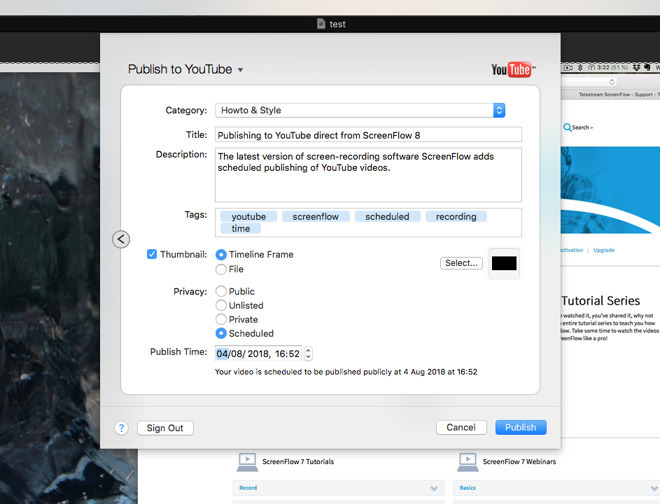 You've also been able to publish the video direct from ScreenFlow into services like YouTube or Vimeo. Now ScreenFlow 8 adds an ability to at least help you publish to Instagram. You need to go through some steps getting the video from your Mac onto your phone first but ScreenFlow prepares it for you. Also new is the ability to tell YouTube when you want your video to be published. You can schedule it whenever you like though you have to allow enough time for YouTube to process it. Still, of all the things ScreenFlow 8 has added, this is one that could change the way we use it. This is still the best screen-recording tool and it's preposterous how useful having one of those is. Yet the power and simplicity of using it for YouTube videos is appealing. There's also the fact that having one video tool to do everything would be worth some compromises anyway. ScreenFlow 8 hasn't limited us in any way that we've spotted yet but even if it did, we'd be weighing that against the time and expense of having some projects in this and some in Final Cut Pro X. This is a case where we genuinely believe the core features of ScreenFlow could not be improved. So the makers have built on it to create something new, something more broadly powerful. If you're looking to record your Mac screen for any reason, just buy ScreenFlow 8 now and get on with it. If you're looking to produce videos then at least request a free trial. If you're an existing ScreenFlow user then there are upgrade discounts depending on which version you have. ScreenFlow 8 is available direct from the developer for $129. It requires macOS 10.12 or higher plus a 64-bit Mac with Core i3 or greater recommended.